February is Black History Month in the United States…a time to focus on the contributions and achievements of African Americans not only in the past, but to hear stories of those who are still with us, still writing their stories. George O. Davis is such a person. Part of his work involves helping to expose museum visitors to the stories of others. An exhibit on the Los Angeles Freedom Rally. This took place in May of 1963. Robert Pruitt—Devotion — This exhibit ends on February 17, 2019. Here’s what the Los Angeles Times says about his work. One of the past art exhibits at CAAM featured Nina Chanel Abney. 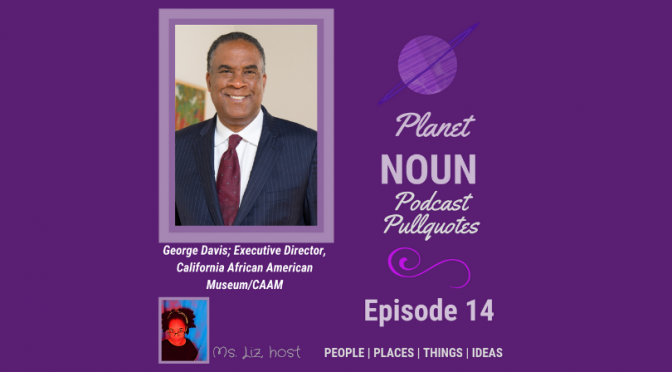 African American artists Davis mentions who are being featured at other museums in the city. Bruce’s Beach in Manhattan Beach, Calif. was talked about in this episode. More on its history along with another area black beachgoers used to frequent in the Santa Monica area called The Inkwell. Acknowledging the facts of history and reckoning with that information to grow beyond our country’s ills…past and present.